The da Vinci Surgical System —a sophisticated robotic platform designed to enable complex surgery by using a minimally-invasive approach— provides superior visualization, enhanced dexterity, greater precision and ergonomic comfort, making it possible for surgeons at Montefiore to perform minimally invasive procedures involving complex dissection or reconstruction. This ultimately raises the standard of care for our complex surgeries, translating into numerous potential patient benefits. 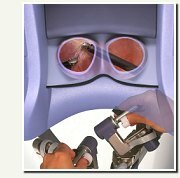 The high-resolution 3D stereo viewer is designed to provide surgeons with an immersive experience. Unlike conventional approaches, the target anatomy appears at high magnification, in brilliant color and with natural depth of field. This allows the surgeon to dissect nerves accurately with minimal trauma and allows for greater nerve preservation during the operation. 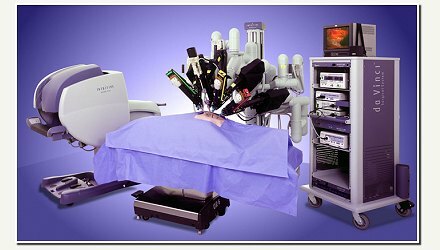 To perform a procedure, the surgeon uses the console's master controls to maneuver the patient-side cart's four robotic arms, which securely hold the patented EndoWrist instruments and high-magnification endoscopic camera. The EndoWrist instruments' jointed-wrist design exceeds the natural range of motion of the human hand; motion scaling and tremor reduction further interpret and refine the surgeon's hand movements. For the patient, a da Vinci procedure can offer all the potential benefits of a minimally invasive procedure, including less pain, less blood loss and less need for blood transfusions. Even more important is the robot's record in preserving erectile function and urinary continence after prostate surgery. Moreover, the da Vinci System can enable a shorter hospital stay, a quicker recovery and faster return to normal daily activities.